Usually by this time each year the winter storms are hitting and all the lights get drenched and whipped around by the wind. So far the winter has been mild. Huh, ya, except it started raining today! Haha. Maybe the winter rains have finally begun. One foot of snow expected in the Sierras from this storm system. Wah besai amai rumah kitak Puteri.Meriah nampak lampu nya..
Chantique, semadi ditagang diau dalam rumah. Pintu dikebak ngasoh angin chelap tama! Pat, sedang2 lah size rumah kami nya! Ka ngaga besai agi dudi ila! Sigi meriah lampu baka nya .. enggi kami nya semadi nadai aja! Haha. Puteri,I also put up outdoor light by myself...but I just took the photo in my new camera,still trying my way to download,sesat jalan,aiyoh! !..btw,hop to my blog to get your cute award...hehehe!! oh!! did you said you hung your light inside the house??.how ? Beachlover, I hung the lights under the roof line, not at the edge the roof. Not inside the house lah. Also at the Domain Control center click the forwarding tab, and enable redirect - redirect to your blogger account url. Last thing is at the Settings in Blogger, switch to custom domain name ... you already have the domain name so no need to check for availability anymore. In the url field for your custom domain name, make sure you put www. before your domain name dot com View site, your new domain name is online. im_puter at yahoo dot com .. my email address. Two days already should be showing lah .. the most it takes is a couple of hours. Thanks for your fast answer...it's really along story how I bought my 2 domain with 2 different company..now my head pusing pusing already setting up my new camera,also another problem..ok...let me email you after I try to work wt control panel .Thanks again..
they look ever so gorgeous! i just love this time of the year, everyone's so happy, merry and its beautiful this time around! 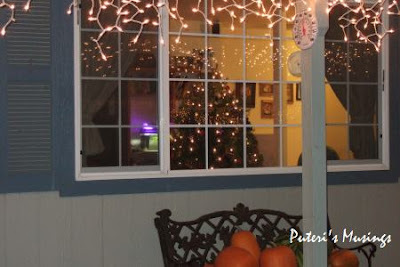 you'll get to see houses all lighted up! better to hang from inside jugak kan!? you guys are so clever la! We clever kah? Hehhe. A lot of work to hang the lights from the edge of the roof. When you hang them from the inside beam, Doug doesn't have to use a stepladder. Also makes the taking down easier. This time of year is indeed a beautiful time of the year. I hope to see Christmas time in downtown Manhattan one of these days! I hear it is really beautiful there! 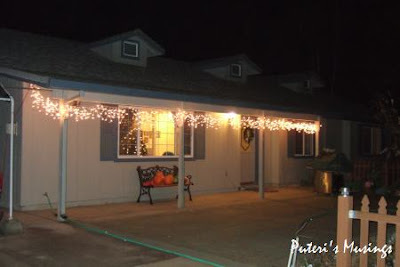 We also had the same christmas light hung on our porch... Just had it done today... Waduh, so tiring... Back is killing me. Oh, by the way, is that Denice in the picture? 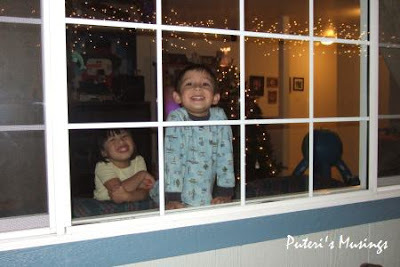 The two kids in the window are Denice and Duncan. Despite the cold weather Denice likes to wear dresses during the day and short sleeves pajamas to bed. In Malaysia, you see all the colorful lights strung out during Hari Raya and not so much during the other festivals, except the malls and hotels. Here, in some neighbourhoods everyone participates and what a pretty sight those neighbourhoods are. 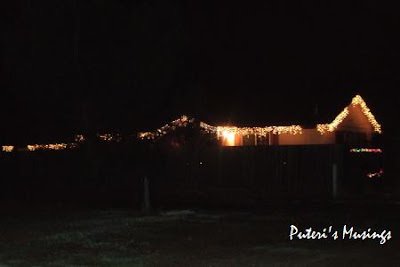 People from outside the neighbourhoods would drive around to look at the Chrismtmas decorations outside the homes. Not so much in my neighbourhood though I have noticed some homes who went all out to decorate the outside. I have no mood to decorate our apartment. I was hoping that hubby won't make the Christmas Tree but unfortunately he brought some home from his dad today. I'm tired of cleaning those falling leaves everyday. Haha, Bee Ean, I just leave those needles alone till I cannot tahan looking at them any longer than I sweep them up! Some more my kids like to go too close to the tree and squeeze against the wall next to the tree! So more needles come off the tree.